CANADA SCOTT 95 USED WITH MODERATE CANCEL BUT NICELY CENTERED. 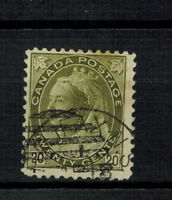 CANADA SCOTT 106ix WITH STRONG HAIRLINES USED AND WELL CENTERED. CANADA SCOTT 84 USED WITH HALIFAX CDS CANCEL. CANADA SCOTT 123 USED LIGHT CDS CANCEL. CANADA SCOTT 94 USED AND NICELY CENTERED. CANADA SCOTT 176 USED STONY PLAIN ALTA AP 15 34 CDS CANCEL.